Mar 20, 2015 | By CENS | WILLIAM TOOLS CO., LTD.
Decades ago auto mechanics and workers on assembly lies manually torqued bolts without knowing exactly the force applied or if such specification mattered. But torque tools as wrenches have come a long way, besides continuing being routinely essential tools used in industrial production, maintenance and repair of machinery, vessels, cars, motorcycles etc., to have become digitized to deliver precise force. Now both weekend mechanics and professionals can rely on modern day torque tools without concern about improper torque applied to possibly cause structural failure with lethal consequences especially when a fastener is constantly under dynamic loads. 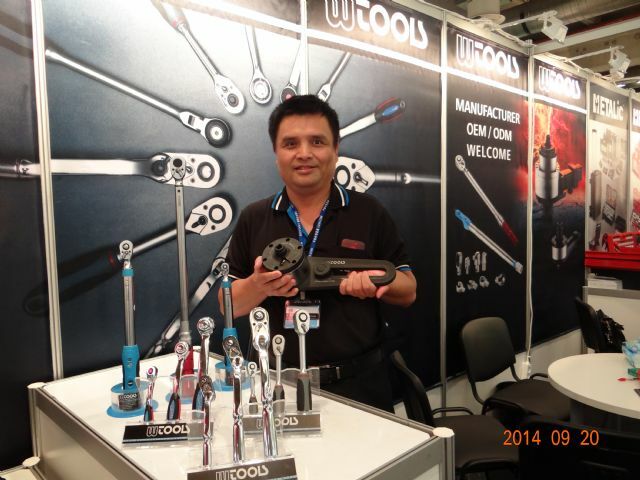 William Tools’s general manager Michael Wu holds the industrial torque multiplier. William Tools Co., Ltd., a Taiwanese top-end original design manufacturer (ODM) of ratchet handles, torque tools and related accessories, has played a part to improve precision in torque tools, by steadily investing in improving and optimizing such products to have worked out a slate of high-end tools that ensure end-users exceptional precision, functionality and quality. William Tools has just lunched an industrial torque multiplier to help customers explore the emerging segments in refineries, pipelines, oil and gas installation, wind turbine construction and maintenance. The firm's torque multipliers have improved structure composed of a high-precision gearbox and components to achieve easy, effortless torque amplification. One model raises input torque of 215 Nm to 2,700 Nm by rotating the input end 16 times with an ordinary torque wrench, to be ideal for fastening lugs in car wheels and other processes requiring substantial manually applied torque that has to be absolutely accurate to ensure safety. This torque multiplier has 10,000Nm output capacity in this series. To make sure high precision and accuracy of its torque tools are achieved, and consolidate its lead in the sector of torque wrenches, the firm teamed up with the Industrial Technology Research Institute, a Taiwanese R&D institute engaged in wide ranging technological development, a few years ago to develop the island's first homegrown digital torque calibrator for their own use. With beefed-up processor precisely detecting calibrations, it stores data in a device that is conveniently transmitted via USB interface to computers for further analysis. The firm's general manager, Michael Wu, says that, unlike conventional calibrators, the device provides more precise readings throughout the entire calibration. This method to calibrate torque wrenches is a growing trend for being the most effective and accurate possible calibration to ensure optimal tool condition. 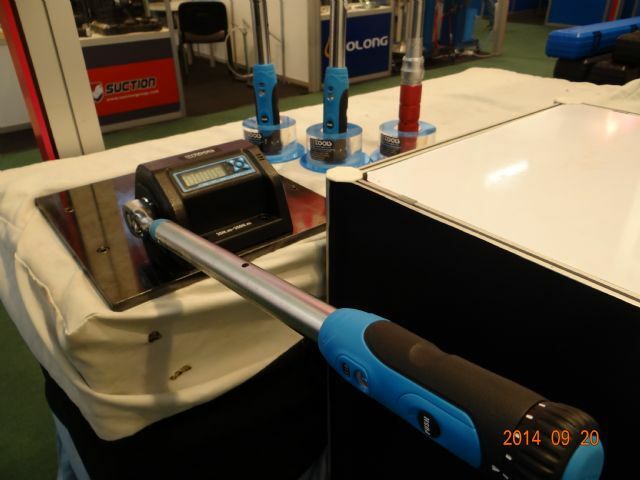 As a technology-driven manufacturer, William Tools is developing a new type torque wrench for electric car service, having already supplied tools for car production and maintenance as for wheel, engine and TPMS (tire-pressure monitoring system). William Tools’s digital torque calibrator has beefed-up processor to precisely measure applied force and output. William Tools develops various tools and accessories with diverse specifications and designs in wider-ranging combinations and applications to meet demand for highly customized solutions of professional tools, mainly for industrial purposes. This is part of William Tools' diversification strategy that depends on strong R&D capability to succeed, said Wu. Founded in 1999, the company has built a solid name as a torque wrench expert among buyers from the U.S., European and Asian countries. It can turn out two million torque wrenches ranging from 5m/n to 1,000m/n and ratchet wrenches up to 1 inch in size a year. With its products increasingly accepted by professionals, the firm is expected to see 20 percent revenue growth this year. Bolstered by ample knowledge of geometry and structural engineering for developing ratchet handles and torque tools, as well as well-honed workmanship and production techniques, William Tools has continuously improved products for years, and has worked out many high-quality tools with optimally engineered structure and exterior that are highly marketable due to enhancing end-user experience. Such effort has helped the maker tap supply chains of global major branded vendors, to pave the road to further growth in markets worldwide. 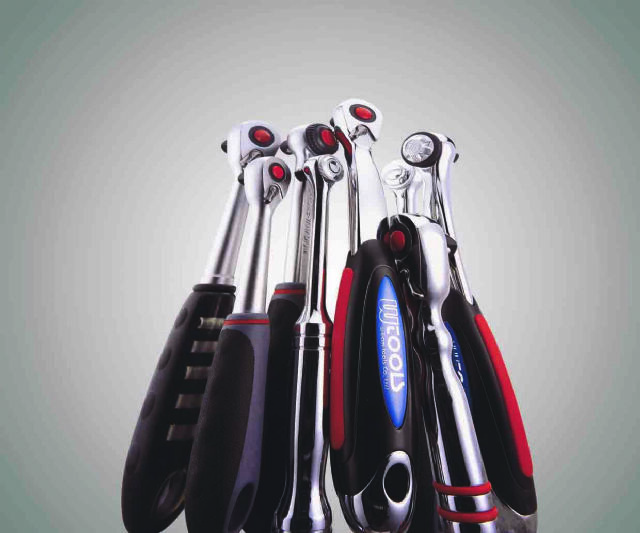 William Tools is Taiwan’s top-caliber ODM of ratchet handles and torque tools for global branded vendors.